While we give more information on the Litter-Robot III below, the basics of how it works are simple: After your special cat finishes using the Litter-Robot III and exits, there’s an automatic delay to allow the litter to clump before the self-cleaning mode kicks in. When self-cleaning begins the top of the Litter-Robot III automatically rotates, sifting clumped litter and hard waste out of the litter box and into a carbon-filtered drawer below. The top of the Little Robot III then returns to its normal position and is ready to use again. 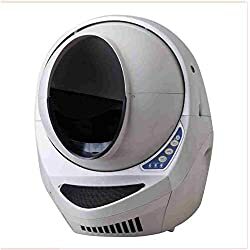 Below is the Litter Robot III for sale on Amazon and eBay. For more information about the Litter Robot please scroll down the page. Be sure to see the Amazon customer reviews of the Litter Robot III. Above is a Litter Robot III self cleaning litter box on Amazon, and below are Litter Robot IIIs for sale on eBay. (The ones on eBay are mostly new, but not all. Be sure to read the description to know if a seller is offering a new or used item.) When comparing prices, be sure to factor in shipping costs! What might, at first, seem to be a better deal might actually be more expensive by the time you add shipping costs. This quick (0:31) video gives an animated overview of the Litter-Robot and how it works. We have a longer, more detailed video lower on this page. The Litter Robot III does require electricity. It does NOT require special litter; any clumping cat litter is fine. 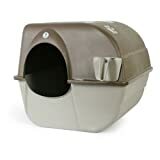 The enlarged entryway and litter chamber, along with the self-adjusting cat sensor, accommodate cats weighing 5 lbs. or more. Once your cat exits, a timer counts down, allowing waste to clump before a cleaning cycle begins automatically. As the globe slowly rotates, the patented sifting system separates the clean litter from the clumps and drops the waste into a carbon-filtered drawer. The globe returns to the home position, leaving a clean, level bed of litter for the next use. Uses clumping litter and kitchen garbage bags. NO SPECIAL ACCESSORIES REQUIRED. It will need to be plugged into a wall outlet, but that’s it. No special litter, liners, bags, solutions, or anything else. All you need is clumping litter. They do sell special Litter Robot liners for the waste tray if you want to use them, but you can also use ordinary kitchen garbage bags. Drawer Full Indicator: A flashing blue light lets you know when the waste drawer is full, so there’s no more guessing. Control Panel Lockout: Prevent kids and cats from unnecessarily pressing buttons, which could change your settings or cycle the unit. Adjustable Cycle Timer: Choose a 3-, 7-, or 15-minute delay from the time your cat uses the Litter-Robot until it performs a cleaning cycle. 8-Hour Sleep Mode: When activated, for a period of 8 hours, your unit will only cycle when the button is pressed manually to prevent disturbances. 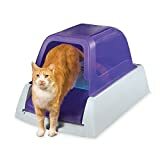 Automatic Night Light: Illuminates the litter chamber in low light conditions for elderly cats. Backup Battery (Sold Separately): The Backup Battery provides up to 48 hours of operation if power is interrupted. Estimated operation time is based on 10 cleaning cycles per day, which is typical for two cats, but results will vary. Backed by a 90-day money back guarantee and 18-month full warranty. This next video is slightly longer (2:21) that the one above, but gives a good look at the Litter Robot and a nice overview of it in action. The Litter-Robot III, just as the name implies, is the third version of a cat litter box named the Litter-Robot. The first two versions of the Litter-Robot were: 1) The Litter-Robot, sometimes called the Litter-Robot Classic version; and 2) The Litter-Robot Bubble version, which was essentially the same as the Classic but with a bubble shaped window on the back to provide more space from front to back. It’s called the Open Air because the large, elliptically-shaped, upward-facing entrance opens into a spacious litter chamber. This gives the Litter-Robot III an open air look and feel that not only looks attractive, it makes it easy for both small and large cats to use it. The Litter-Robot III’s entryway, litter chamber, and weight sensor can accommodate cats weighing 5 pounds or more. The Litter-Robot III can use any self-clumping cat litter. The holding drawer of the Litter-Robot III can use ordinary kitchen garbage bags, so there’s no need to buy special (expensive) bags. It has an adjustable timer so you can choose between several different time settings, in minutes, to wait after your cat leaves the Litter-Robot III until it performs a cleaning cycle. This allows you to adjust the delay according to the brand of clumping litter you choose. No guessing! The Litter-Robot III has a flashing light to let you know when the waste drawer is full. The electronic control panel has a lockout feature to prevent cats or kids from pushing buttons and changing your settings. An automatic nightlight helps cats see in the litter chamber at night, which the manufacturer says is particularly helpful for older cats. It has an 8-hour sleep mode: When the sleep-mode is activated the Litter-Robot III will only cycle when a button is manually pressed manually to prevent disturbances. Odors are contained in the holding drawer and managed by a large carbon filter. Compared to earlier versions it has a larger globe (or top portion, also called the litter chamber) with a larger, differently shaped opening than earlier versions. It comes out of the box fully assembled, although putting the top part (the globe) on the bottom part (the holding drawer) will be necessary. The Litter-Robot is made by Automated Pet Care Products.